Welcome to the Mercure Limoges Royal Limousin hotel! A contemporary hotel, a 10-minute walk from the train station. Take advantage of our privileged location in the heart of the city center and discover the capital of ceramic arts. The 4-star Mercure Limoges Royal Limousin Hotel is located in the city centre facing the place de la République. Some contemporary-style rooms have terraces overlooking the pedestrian square. 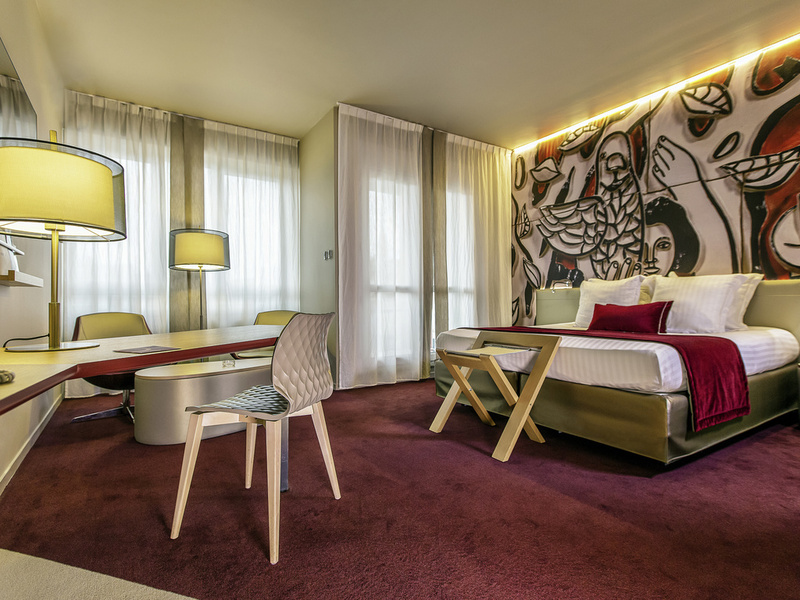 Located close to the historic Limoges-Bénédictins train station, our hotel will allow you to enjoy all the sights and advantages of the Limoges metropolis for business or pleasure. During your business or leisure trip, take some time to explore the Bénédictins Station, Adrien Dubouché National Museum, the historic quarter, the Evêché gardens, the Museum of Fine Art, the pedestrianised streets and the Opera Theatre. In the heart of the historic center of the "City of Art and History"
Discover our 65" connected touchscreens and communicate on projects in real-time! Restaurant menu at the bar Sundays 7:30 pm to 10:30 pm except during holiday periods. Pets for a surcharge except in the eating areas. Our teams welcome you Monday to Sunday from 6:30 am to midnight for beverage service. A restaurant menu served only at the bar on Sundays, 7:30 pm to 10:30 pm, except during holiday periods. Cher Client, Merci pour l'avis que vous avez laissé sur notre hôtel. Nous sommes ravis que vous ayez apprécié votre séjour et espérons vous accueillir à nouveau très bientôt. Sincèrement, Carole. This was a last-minute stay, the hotel were very accommodating even though most of their rooms were already taken. Rooms are nicely refurbished even though the actual hotel building is old. Location is good, right in the middle of town, although parking is only available on the street. Dear Guest, Thank you for your feedback. It is a pleasure to share your comments with our teams. We are glad you enjoyed your stay with us. We look forward to see you again in Limoges! Sincerely, Carole. I really enjoy staying at the Mercure Limoges. The hotel is clean and conveniently located, rooms and particularly beds are very comfortable, breakfast is good but most importantly the staff are fiednly and helpful. I have recommended this hotel to my colleagues previously and am happy to do so in future. Dear Guest, Thank you for the great review of our hotel! We are glad that you enjoyed your stay and hope to see you again very soon. Sincerely, Carole and Anaïs. I had a problem with my booking: I reserved for 2 Feb but when I called the hotel about parking on the day, they had my booking for 2 March. This is the THIRD time that I have had this problem with your website. I work in tourism (DMC) and frequently book hotels, services, flights and have never made a similar mistake. I understand that the hotel staff cannot change the booking and we paid the difference but this will influence my choice of hotel in the future. Cher Client, Un grand MERCI pour ce formidable avis ;) Au plaisir de vous accueillir à nouveau très bientôt ! Sincèrement, Carole. Dear Guest, Thank you for the great review of our hotel! We are glad that you enjoyed your stay and hope to see you again very soon. Best wishes, Carole. Very friendly and helpful staff,very good breakfast,hotel located right in the city center,close to restaurants .Lovely spacious room. Dear Guest, Thank you for the great review of our hotel! We are glad that you enjoyed your stay and hope to see you again very soon. Best wishes, Sincerely, Carole. Conveniently situated, quiet comfortable room and a great breakfast. Dear Guest, Thank you for the great review of our hotel! We are glad that you enjoyed your stay and hope to see you again very soon. Sincerely, Carole. We had an excellent stay albeit brief. We were well received by the receptionist as one expects at Accor. The bedroom was very nice,clean and comfortable. Our express and co breakfast was very good. We look forward to staying again. Nice room Work on square finished late and started early. We were put in a front facing room, which is ok if the hotel was full, but thoughtless otherwise. Dear Guest, Thank you for taking the time to give us your feedback. We are glad that you enjoyed your room. Indeed, works of the &quot;Place de la République&quot; began since a few weeks ... but it is for the good cause! When the place has been completely renovated, it will offer to the hotel the new place to be with plenty of activities and shops for the greatest pleasure of all. Fortunately, works take place during the day and allows our customers to enjoy their night. Hoping that this additional information will have been useful to you, Sincerely, Carole and Anaïs. Good reception. Bar area rather limited, made worse by a procession of people signing in to a promotional event. Clean and comfortable room. Unnecessarily complicated shower. Good breakfast. Dear Guest, Thank you for taking time to give us your opinion on your stay in our hotel. We are delighted that you enjoyed your stay and hope to welcome you again during a next visit in Limoges! Sincerely, Carole and Anaïs. fantastic position in the town centre with a nearby parking facility very cheap. we chose the privilege room and we g ota gorgeous room with bathrobe and slippers, free minibar and nesprsso coffee machine. very good breakfast we ate in the morning skipping the lunch. Well trained efficient and pleasant staff who could not have been more helpful. We particularly enjoyed our balcony room. We were impressed with the hotel including the room, the friendly staff, the good breakfast and excellent location. Our room was ok although the shower above bath had no curtain so a lot of water was on the bathroom floor. Toilet very small and claustrophobic. Payed for breakfast which was a help yourself buffet. Found that the hot food container was not working therefore sausage bacon and scrambled eggs were stone cold. Pointed this out to staff who took away our plates of food and microwaved them. Did not taste good and left food. Really disappointed with our experience on this occasion stayed here number of previous times no problems. Dear Guest, Thank you for sharing your experience in our hotel. We are sorry that the service was not as high as your expectations. We wish to satisfy our customers, and we regret not having been able to do so for you. Regards, Carole and Anaïs. The hotel and friendliness of the staff was excellent. The room had everything for an enjoyable stay with 1st class toilet and shower facilities. The only cause for anxiety was the car parking which was 3.50€ for 2 hrs or 12 € per day in the underground public car park opposite which has a door directly into the hotel. Wonderful hotel, we’ll be coming back! Wonderful room, lovely comfy bed, amazing shower, peaceful but central location, great breakfast and excellent staff. Can’t fault our experience. Dear Guest, A huge thank you for your feedback! It is a pleasure to share your comments with our teams. We are glad you enjoyed your stay with us. We look forward to see you again in Limoges! Sincerely, Carole.